Addis Ababa Light Rail (Amharic: የአዲስ አበባ ቀላል ባቡር) is a light rail transportation system in Addis Ababa, Ethiopia. It is the first light rail and rapid transit in eastern and sub-saharan Africa. A 17-kilometre (11 mi) line running from the city centre to industrial areas in the south of the city opened on 20 September 2015, inaugurated by Prime Minister Hailemariam Desalegn. Service began on 9 November 2015 for the second line (west-east). The total length of both lines is 31.6 kilometres (19.6 mi), with 39 stations. Trains are expected to be able to reach maximum speeds of 70 km/h (43 mph). The railway was contracted by the China Railway Group Limited. The Ethiopian Railways Corporation began construction of the double track electrified light rail transit project in December 2011 after securing funds from the Export-Import Bank of China. Trial operations were begun on 1 February 2015, with several months of testing following that. It is operated by the Shenzhen Metro Group. Of the two line rail lines, the east-west line extends 17.4 kilometres (10.8 mi), stretching from Ayat Village to Torhailoch, and passing through Megenagna, Meskel Square, Legehar and Mexico Square. The north-south line, which is 16.9 kilometres (10.5 mi) in length, passes through Menelik II Square, Merkato, Lideta, Legehar, Meskel Square, Gotera and Kaliti. However, two lines have a common track of about 2.7 km. The common track is the elevated section which runs east to west across the southern edge of the CBD from Meskel Square to Mexico Square, and onwards to Lideta. Trains on the north south line are blue and white, whilst on the east west line they are green and white. The Fares cost 2-6 Ethiopian birr. Tickets are bought at orange coloured kiosks next to each station. The final cost to build the railway was US$475m, with construction taking three years. The Addis Ababa Light Rail was originally to have a total of 41 stations on its two lines, and each train was planned have a capacity to carry 286 passengers. This will enable the light rail transit to provide a transportation service to 15,000 passengers per hour per direction (PPHPD) and 60,000 in all four directions. The railway lines have their own dedicated power grid. According to CREC the system carried on average 113,500 daily passengers in January 2016 with 153,000 passengers as highest passenger load during a single day. Service frequency was 10 minutes during peak hours on both lines and 20 minutes during off-peak hours. On average there were 94 train rotations on the Blue line (3,177.2 vehicle-kilometre) and 93 rotations on the Green line (3,236.4 vehicle-kilometre). There are future plans for extensions in all four directions. According to Getachew Betru, CEO of Ethiopian Railways Corporation, the Ethiopian government indicated that any new line built should be completely grade-separated. Apart from extending the existing lines, two new lines are under consideration by the Ethiopian government. The first one will start at St. George's Cathedral, pass along Mexico Square to the African Union Headquarters and will terminate at Lebu, connecting to the new national rail network. The second line will start at Megenagna Roundabout and passes via Bole Airport, Wello Sefer area, Saris market area and Jommo area and terminates at Lebu. 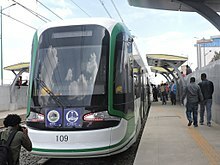 Addis Ababa Light Rail operates currently a fleet of 41 three-section 70% low-floor trams manufactured by CNR Changchun. The 2.7 km common section from St. Lideta (West) to Meskel Square (East), with 5 stops. The 16.9 km Blue Line from Menelik Square (North) to Kaliti (South). The 17.4 km Green Line runs east from Ayat (East) to Tor Hailoch (West), with 22 stops. ^ "Expansion of LRT will commence in 2016". capitalethiopia.com. ^ "A Bridge Too Far". addisfortune.net. ^ a b "Addis Ababa light rail opens". Railway Gazette International. 2015-09-21. Archived from the original on 2015-09-26. Retrieved 2016-02-21. Insisting that ‘the light rail is not for commercial purposes’, Gebeyehu explained that ticket prices would be ‘very cheap’ in order to ‘serve people with low incomes’. ^ "Addis Light Rail Progress". Railways Africa. 2 October 2013. Retrieved 2013-11-25. ^ a b c Sahle, Eden (22 September 2015). "Ethiopia: Addis Light Rail Eases Transportation Problem". AllAfrica. Retrieved 2015-09-23. ^ a b c d e "Sub-Saharan Africa gets its first metro". The Economist. 22 September 2015. Retrieved 2015-11-14. ^ a b Asrat, Amare (10 November 2015). "Addis light rail Hayat - Torhailoch route begins operation". Ethiopian News Agency. Addis Ababa. Archived from the original on 17 November 2015. Retrieved 2015-11-13. ^ a b "Addis Ababa opens second light rail line". Railway Gazette International. 12 November 2015. Retrieved 2015-11-14. ^ a b "中国企业承建的埃塞俄比亚首都城市轻轨开始试运行(高清组图)". ifeng.com (in Chinese). 2 February 2015. ^ a b c "Corporation discloses/Addis light rail project detail". The Ethiopian Herald. 10 March 2013. Archived from the original on 9 November 2013. Retrieved 25 October 2014. ^ "Ethiopia: Addis Light Railway to Go Operational Next Month". AllAfrica. 30 December 2014. Retrieved 2015-01-26. ^ "Shenzhen Metro Group to operate Ethiopian light rail". Shenzhen Daily. 4 December 2014. Retrieved 2015-09-21. ^ Nurse, Earl (2 November 2015). "Sub-Saharan Africa gets its first metro". CNN. Retrieved 2015-11-14. ^ "Ride along". The Reporter Ethiopia. 26 September 2015. Archived from the original on 18 November 2015. Retrieved 2015-11-17. 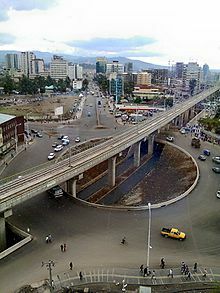 Wikimedia Commons has media related to Addis Ababa Light Rail.